Found 6 file extension associations related to ThinkFree Write and 1 file format developed specifically for use with ThinkFree Write. Developer / company: ThinkFree Inc.
ThinkFree Write uses the same file formats as Microsoft Word in order to maximize file compatibility. The ThinkFree Write interface looks, feels, and behaves like Microsoft word. Minimize the learning curve and rest assured that your documents will look the same in ThinkFree Write as they do in Microsoft Office - no matter what editing features are used. ThinkFree Write supports Header and Footer; which facilitates inserting content that is repeated on every page such as page numbers, whole page numbers, date and time. The ThinkFree Write tool bar gives users fast access to this advanced tool. ThinkFree Write supports advanced Microsoft Word formatting features such as the section editing capability, which facilitates the creation of documents with complex layouts. For instance you can easily create a document that mix different column layouts even on a single page. With ThinkFree Write's Drop Cap tool, you can easily emphasize the first letter of a paragraph for added weight. 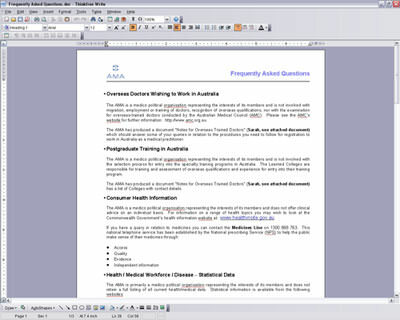 ThinkFree Write provides Microsoft Word-like features in Table editing. You can insert tables, delete tables/rows/columns/cells, select tables/rows/columns/cells, merge cells, split tables/cells, handle borders, shading, and AutoFit. When viewing the document in full screen mode toolbars are removed to give you more room to work on your document. You still have the ability to choose commands from the main menu. Use the format painter to copy the format of one text block to another. If you need more information please contact the developers of ThinkFree Write (ThinkFree Inc.), or check out their product website.